(Chicago) – TASC’s work in Illinois is helping to inform international strategies to save lives and divert people with substance use disorders away from the justice system and into community-based treatment. On August 20, TASC hosted visiting dignitaries from the U.S. Department of State, Bureau of International Narcotics and Law Enforcement Affairs (INL) for discussions on criminal justice responses to the opioid crisis and alternatives to incarceration, based on the recognition that international supply reduction strategies can inform and support, and be supported by, local efforts across the country. INL helps countries across the globe strengthen their criminal justice systems in order to reduce the entry of illegal drugs and crime in the U.S.
INL Deputy Assistant Secretary James A. Walsh and Michele Greenstein, acting director of INL’s Office of Criminal Justice and Assistance Partnership (CAP), were welcomed by TASC President Pam Rodriguez, who facilitated a roundtable discussion with local criminal justice leaders, including Judge LeRoy Martin, presiding judge of the Criminal Division of the Circuit Court of Cook County, Cook County State’s Attorney Kim Foxx, Cook County Public Defender Amy Campanelli, Cook County Circuit Judge Charles P. Burns, Judge Lawrence Fox, director of specialty courts for Cook County, and Chief Eric Guenther of the Mundelein Police Department. Leaders presented a continuum of criminal justice diversion strategies and alternatives to incarceration that exist in Cook and Lake counties for people who have substance use disorders. 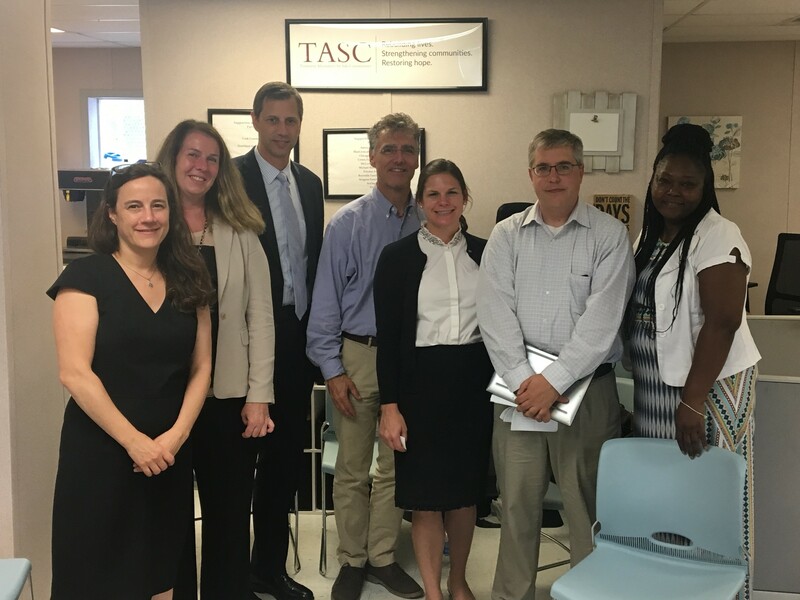 Following the roundtable discussion, Walsh and Greenstein visited TASC’s Supportive Release Center, meeting with TASC staff as well as Cook County Sheriff Tom Dart, whose website offers information on array of resources on overdose prevention and recovery. Today, communities across the globe are recognizing International Overdose Awareness Day, observed annually on August 31 to raise awareness around overdose prevention, reduce the stigma of a drug-related death, and acknowledge the grief felt by families and friends who have lost loved ones to drug overdose. INL dignitaries and Sheriff Dart at TASC Supportive Release Center, August 20, 2018. (l. to r.) Michele Greenstein, INL; Alicia Osborne, TASC; INL Deputy Assistant Secretary James Walsh; Cook County Sheriff Tom Dart; Dr. Jane Gubser, Cook County Dept. of Corrections; Joe Ryan, Cook County Sheriff’s Dept. ; Robin Moore, TASC.